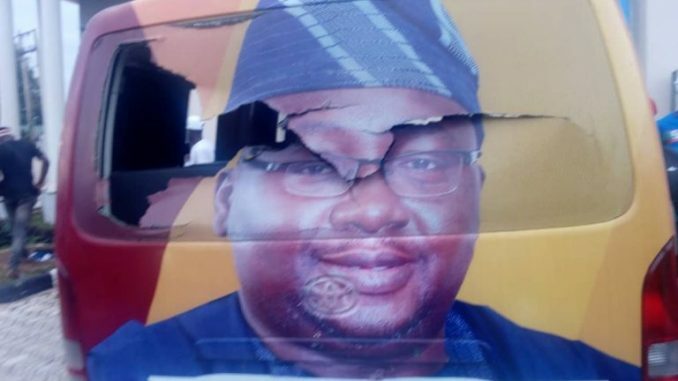 Suspected political thugs, Tuesday, launched an attack on the convoy of former Deputy Governor (Operations) of Central Bank of Nigeria, Chief Adebayo Adelabu in Ibadan, the Oyo State capital. Adelabu, who recently resigned from the apex bank to join the gubernatorial race in the state, Hope For Nigeria reports, was at the Ibadan North West Local Government chapter of the ruling All Progressives Congress (APC) for his sensitization tour. The attack, occurred barely few minutes after Adelabu left the venue of the meeting at Inanlende area of Ibadan. Though the cause of the attack has not been revealed, it was gathered that his entry into the gubernatorial race had become a source of headache for others aspirants under the platform of the APC. A source at the scene said that many people were injured during the attack. He added that several cars and buses, including those in the convoy of Adelabu and others belongings to commercial drivers who ply the Mokola-Ayeye Road were also damaged while the attack lasted.